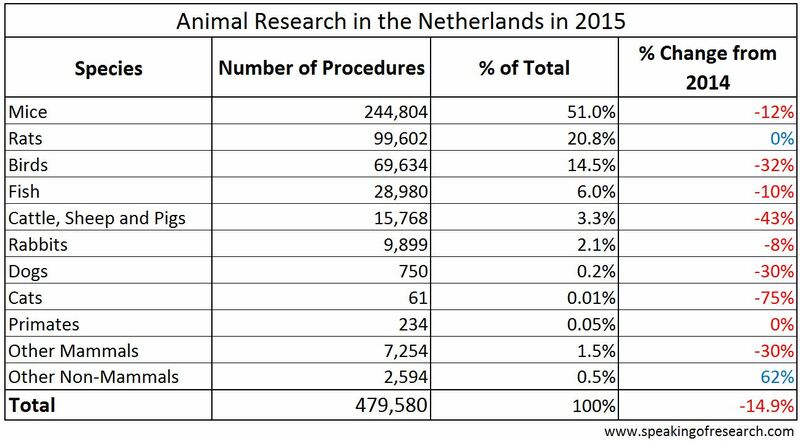 There were 479,580 procedures on animals in the Netherlands for scientific purposes in 2015, down almost 15% from the previous year. This was according to the latest report by the Food and Consumer Product Safety Authority (Nederlandse Voedsel- en Warenautoriteit, NVWA). 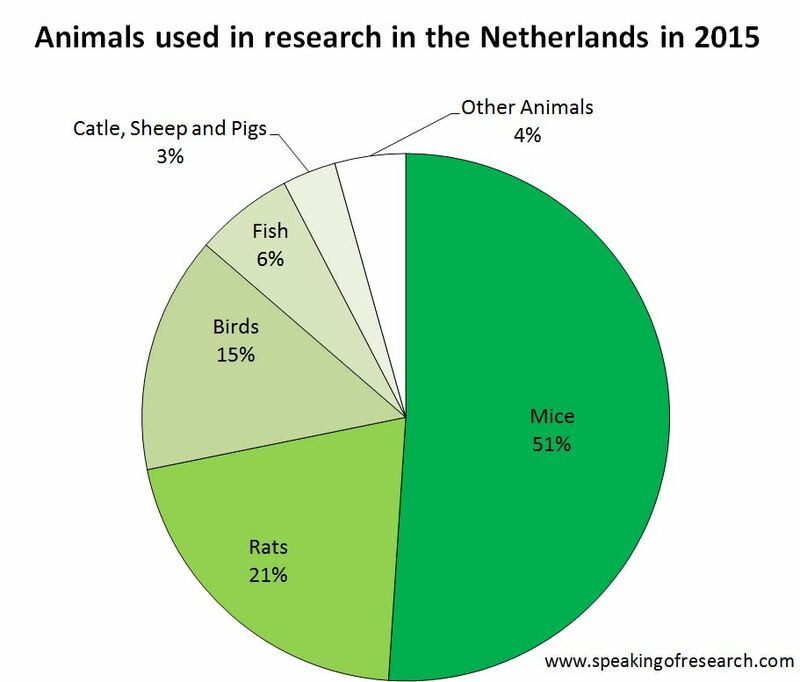 Species of animals used for research in Netherlands in 2015. Click to Enlarge. There were falls in the number of most species used, with the exception of rats (up by under 0.5%) and other non-mammals (up 62%), of which most of the rise were frogs. Larger falls came from cows (down 56%), chickens (down 40%) and pigs (36%). Mice, rats, birds and fish are the most commonly used animals, together accounting for over 90% of all procedures – this is similar to previous years and the figures found in many other EU countries. Dogs, cats and primates together account for less than 0.3% of all procedures in the Netherlands. 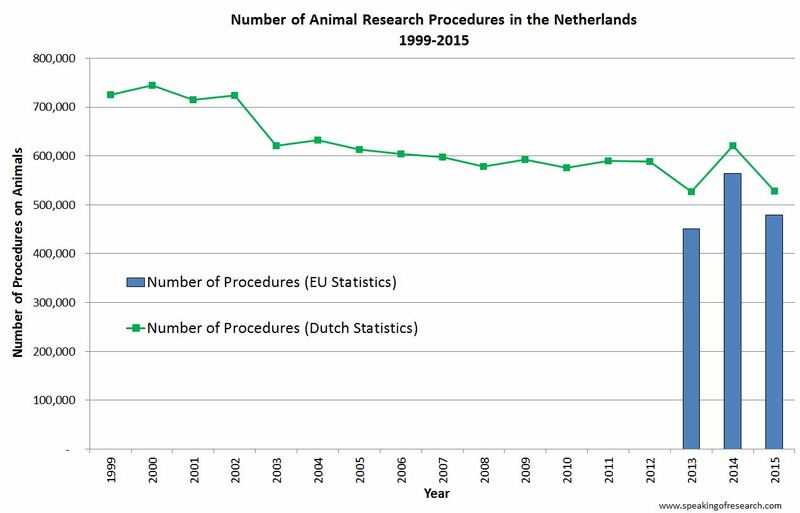 Trends in animal procedures for research in the Netherlands 1999-2015. Click to Enlarge. In 2014 the Netherlands began to produce a set of statistics in accordance with the EU’s method of counting (though they included 2013 figures for comparison). There is a minor difference between how the EU and Netherlands count animal procedures. Primarily in that the Dutch system includes animals killed without a prior procedure (for example, the killing of a mouse for tissue samples that has had no other intervention). The total number of animal studies registered in 2015 (528,159 procedures) minus the number of animals killed without preceding procedure (48,579 procedures) is the number of animal studies for the European registration (479,580 procedures). We have chosen to use statistics according the EU method of counting for our entire analysis as it makes for an easier comparison with other EU countries. As we can see, both methods tend to reflect the same rises and falls in animal numbers. While the EU counting statistics do not go far back enough to see a trend, we can notice a downwards direction in the Dutch counting methods of number of procedures. 2015 was the second year for which the Netherlands has included statistics on the retrospective assessment of severity (i.e. reporting how much an animal actually suffered rather than how much it was predicted to suffer prior to the study). The report showed that 72.2% of procedures were classed as mild (78% in 2014), 19.3% as moderate (17% in 2014), 3.6% as severe (2.7% in 2014), and 4.9% as non-recovery (2% in 2014), where an animal is anaesthetised for surgery, and then not woken up afterwards. As this is the second year of retrospective assessment, the methods used are continuing to be developed (such grimace scales). Most animals used in the Netherlands were mice. Here is some other interesting information provided by the annual statistical release. 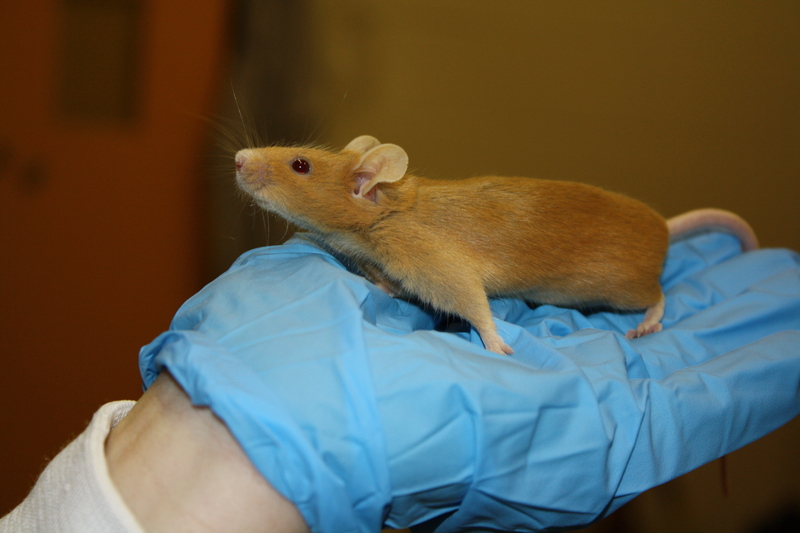 7% animals were genetically modified, 95.8% of which were mice. For animal research statistics of countries around the world please see our statistics page. Posted on December 16, 2016 December 16, 2016 by EditorPosted in News, StatisticsTagged animal testing, Dierproeven, holland, Netherlands, Statistics, stats.